BONUS: This edition contains an excerpt from Robert K. Massie's Catherine the Great. Robert K. Massie was born in Lexington, Kentucky, and studied American history at Yale and European history at Oxford, which he attended as a Rhodes Scholar. He was president of the Authors Guild from 1987 to 1991. 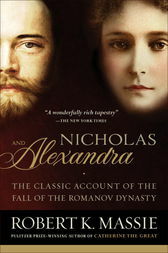 His books include Nicholas and Alexandra, Peter the Great: His Life and World (for which he won a Pulitzer Prize for biography), The Romanovs: The Final Chapter, Dreadnought: Britain, Germany, and the Coming of the Great War, Castles of Steel: Britain, Germany, and the Winning of the Great War at Sea, and Catherine the Great: Portrait of a Woman.